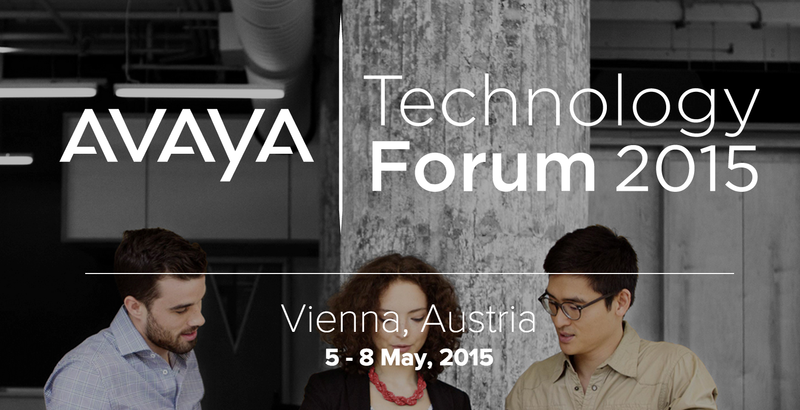 I’m at the 2015 Avaya Technology Forum with Nutanix to talk about Avaya Unified Communications on the Nutanix platform. Stop by the Nutanix and CRI booth to see the Nutanix gear in action. Nutanix 3460 and 1450 nodes will be powering all the demos you see for Avaya Aura and other applications! 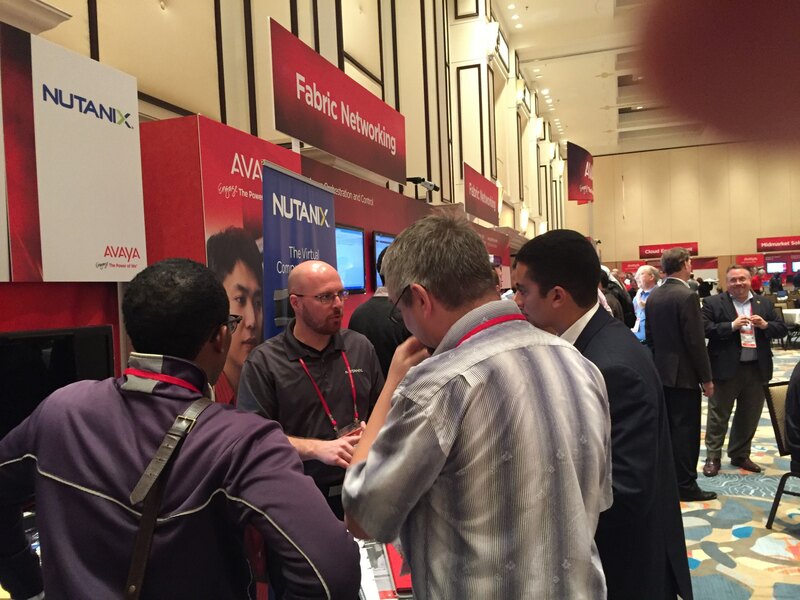 Ensure Avaya Unified Communications applications run flawlessly on Nutanix. Test the Nutanix Distributed File System (NDFS) performance and operation on top of Avaya Fabric Connect. The result of all this work is being presented here at the Avaya Technology Forum in sunny Orlando. The Avaya colleagues I’ve been working with are from the Boston area (and Canada), so I imagine coming down here to find 81 degrees and sunshine is a welcome change! The first item I want to bring to your attention is the Nutanix Avaya Unified Communications Solution Brief. This is a high level piece to show the overall benefits of combining Nutanix and Avaya Unified Communications. Nutanix makes the data center admin’s life easier by eliminating silos between UC and other data center apps, bringing scalable compute and storage to the masses, cutting down on management time, providing blinding fast I/O performance, and tying it all together with high availability baked in. 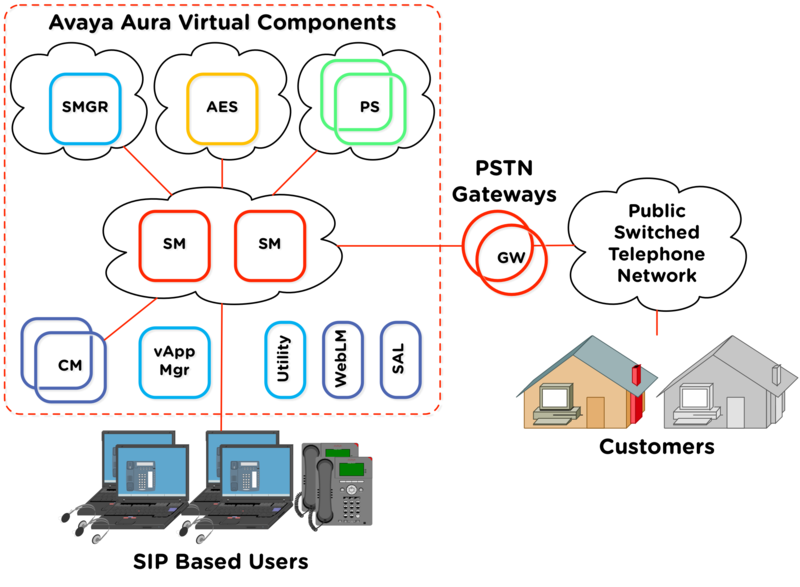 Whether you’re running Avaya IP Office, a full blown contact center with Avaya Aura, or something in between, the Nutanix platform brings web-scale technologies to these virtual applications. To top it off – Avaya Fabric Connect technologies allow the data center admin to provision highly resilient, low-latency, high-throughput network backbones without the drawbacks of traditional spanning tree architectures. 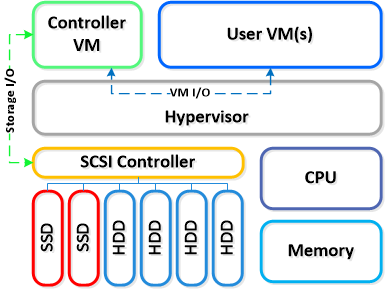 Nutanix performs hyper-convergence at the storage and compute layer using a software defined Controller Virtual Machine. Find out more here at the Nutanix Bible to see how Nutanix ties together the disks of many nodes to form a resilient, distributed, high-performance compute and storage cluster. Avaya brings Software Defined Networking and Virtualization with Avaya Fabric Connect. These two technologies together save time and money in the datacenter, while also providing blazing performance. Check back for updates during the conference. 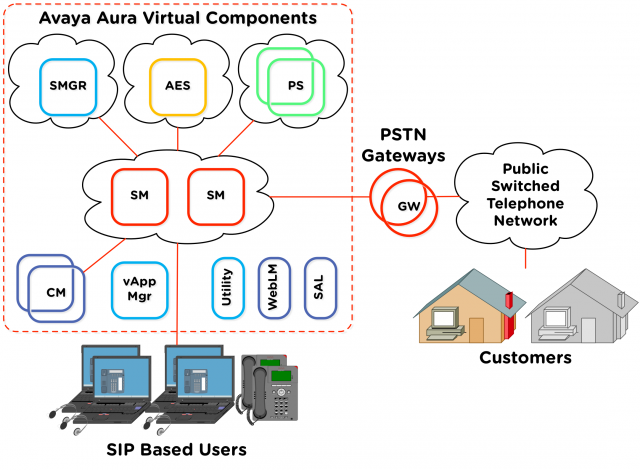 I’ll be sharing a Reference Architecture for Avaya IP Office Server Edition running on Nutanix. In the future you’ll also see a Reference Architecture for Avaya Aura on Nutanix. Find me at the conference by tweeting @bbbburns or stopping by the Nutanix and CRI booth. In the last blog post I talked about sizing individual VMs. Today we’ll look at placing UC VMs onto a Nutanix node (an ESXi host) and coming up with overall system sizing. First I’d like to announce the publication of my document for Virtualizing Cisco UC on Nutanix. Readers of the blog will recognize the content and the diagrams 😉 I’ve combined all of this information for publication and delivery to customers and partners planning to deploy Cisco Unified Communications. Next, let’s look at placing Cisco UC VMs to size a Nutanix system. Once you have a count of all the VMs needed and their individual sizes you can spread them around on paper to see how much hardware rack and stack is in your future. With Nutanix you’ll have a lot less work ahead of you than with any other solution! Use all the methods documented in the previous posts to size the individual VMs. There are a few options for VM placement. I used Omnigraffle on my Mac to create diagrams like the one you see here, but Visio or MS Excel will work just as well. 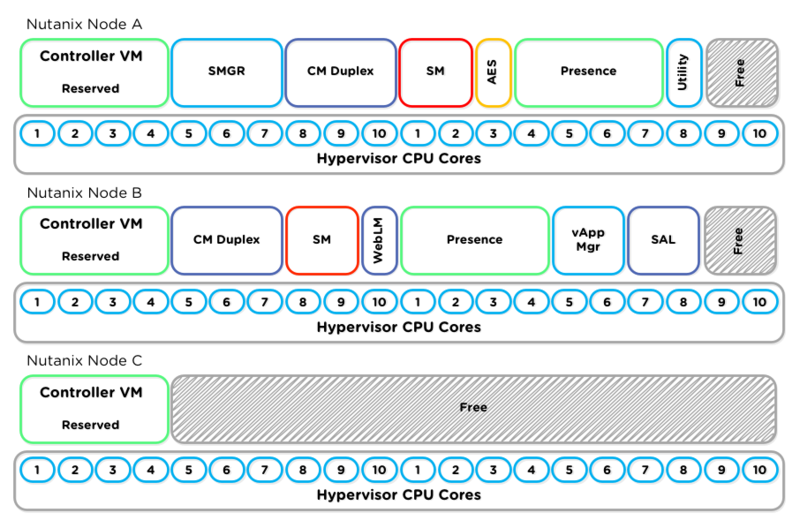 The “Hypervisor CPU Cores” represent the space available on a single Nutanix node. I didn’t specify ESXi, Hyper-V, or KVM directly because Nutanix can support all three hypervisors. In a Nutanix block you can have up to 4 nodes in a 2 RU device. Below we see a single 16 core node. New Nutanix models will be released in the future with different core counts, roughly keeping track with Intel’s releases of new hardware. Size your core count based on what’s available on the Nutanix hardware platform page. *EDIT on 2015-10-23* Nutanix switched to a “Configure To Order” model and now many more processor core options are available, from 2×8 core all the way up to 2×18 core. This provides a lot of flexibility for sizing UC solutions. Take some space and reserve it for the Nutanix Controller Virtual Machine. Exactly how much space reserved really depends on the IO load expected. The CVM will reserve four vCPUs at a minimum. Looking at the CVM properties in vSphere you can see it actually has eight vCPUs provisioned which is why the shaded area exists. These four vCPUs that exist in a limbo state (provisioned but not reserved) can be used by any application that doesn’t mind CPU oversubscription. Unfortunately Cisco UC and most other UC applications don’t allow oversubscription so we have to just chop off eight vCPUs right at the start to abide by Cisco’s requirements. Don’t worry though, four of these vCPUs are not lost entirely. Make good use of them by putting a DHCP server there, or DNS, or a Domain Controller. Put a Linux SFTP backup server there if you like for handling incoming application backups from Cisco UC. Mine bitcoins. These cores are yours, you have options! If you know that a Nutanix node is going to push SERIOUS IO traffic because you’ve read the IOPS requirements and see that you’ll need many many thousands of IOPS for the VMs, bump up the number of vCPUs that you leave for the Nutanix CVM. Under heavy load, the multi-threaded process will use all available vCPUs to handle IO requests. Under normal load the four reserved vCPUs will be plenty. If you’re unsure of the IO load a machine will generate, fear not! 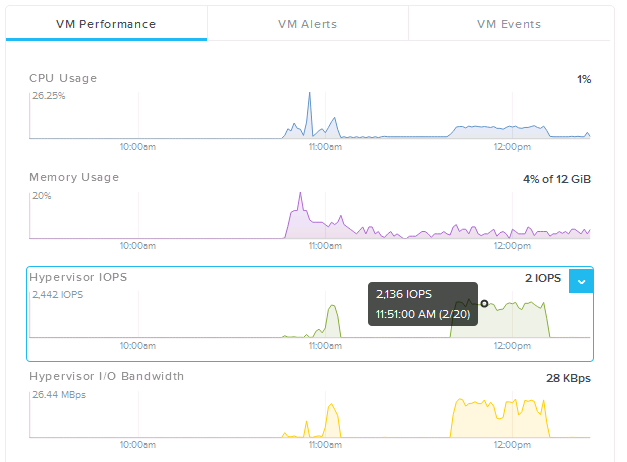 The Nutanix Prism interface shows detailed stats per virtual machine. You can get an idea of what a VM is doing just by watching the Prism page for that VM. Below we see a VM that exhibits a spike in IOPS over a period of time. Along with Excel, Omnigraffle, and Visio, tools exist on the Cisco website to do VM placement. I like to use the UC Placement Tool just because it’s simple. A custom CVM image can be created that uses eight vCPUs (or four) and then the Cisco UC images can be selected from existing templates. This tool is extremely helpful because the sizes of the various Cisco UC components are embedded in the various templates as shown above. The IOPS calculation of this tool isn’t really there yet in the templates. It’s an exercise to the reader (or user) to fill out the expected IOPS of each virtual machine. This info can be cobbled together from the various Cisco wiki pages or from information gathered via the Nutanix Prism page. 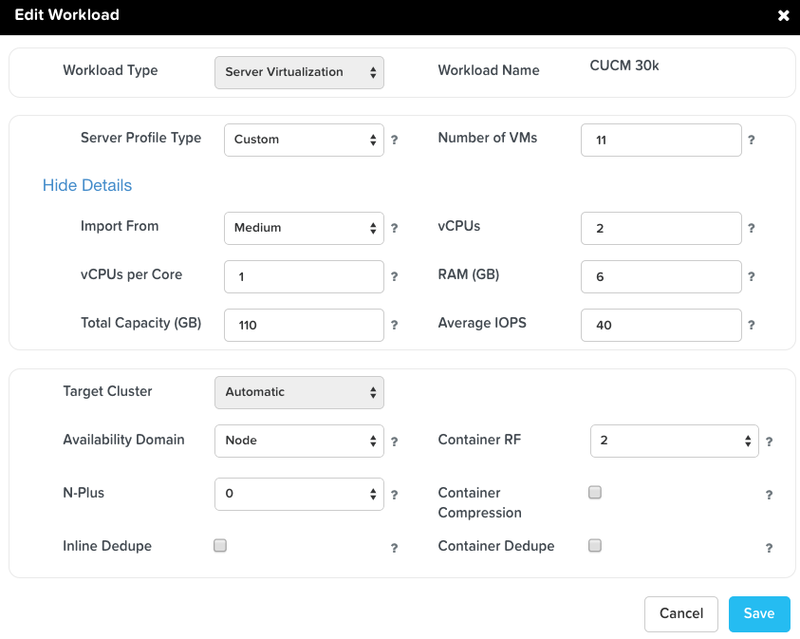 When sizing UC servers, we’ll use the “Server Virtualization” workload type. This means for each VM type (CUCM, CUC, CER) we’ll specify the number of vCPUs, amount of RAM, size of disk, and expected IOPS. Once this information is entered a Nutanix system (along with a number of nodes) will be chosen. This can be checked against sizing calculations above to ensure the right size system is selected. Here we size 11 CUCM virtual machines. 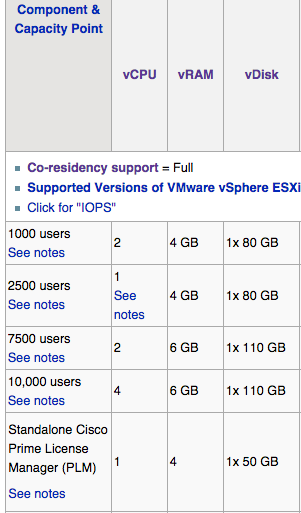 Each VM has 2vCPUs, 6GB RAM, 110GB storage, and an average IOPS of 40 (taken from the Cisco DocWiki). Cisco UC is a unique case because the 1000 series Nutanix processors do not currently meet the hardware processor requirements that Cisco specifies. This means the 1000 series nodes aren’t appropriate for Cisco UC, but all other node types are. We’re going to maximize for CPU cores because of Cisco’s 1:1 core:vCPU mapping. With most Cisco UC virtual machines we won’t run into any storage size or storage performance limitations on the Nutanix system. The primary driver of sizing will be number of free cores! Maximizing for available storage space or other factors due to other workloads (like MS SQL or Exchange for instance) may lead to selection of a different node type. Nodes in a cluster can be many different types and can be mixed together in the same cluster. A cluster will often contain several storage heavy nodes for VMs with large storage requirements. We’ve covered an overview of Cisco UC and Nutanix, and how to size individual UC VMs and place them on a Nutanix system. With this information it’s possible to design a complete Cisco UC solution powered by the Nutanix platform. Assets from both Cisco and Nutanix can be leveraged to build a completely supported UC solution that takes up less rack space, power, and cooling. It’ll be simpler to setup because there are fewer components. It’ll be simpler to manage for the same reason AND because of the slick web front end to the combined compute and storage components. It’ll be more secure because federal STIG requirements are built into the product in easy to manage config settings (running a security script). One click upgrades for the entire compute and storage infrastructure means admins will be spending more time on the slopes or drinking beer and less on weekend change windows. That’s something I can get behind! To learn more about Nutanix I recommend reading through the Nutanix Bible by Steve Poitras. It’s a wealth of great information on how the technology under the hood works. The nu.shool YouTube channel also has some excellent white board videos that I highly recommend. Feel free to reach out to me on Twitter @bbbburns for follow up, or comment here on the blog. In the previous posts we covered an Introduction to Cisco UC and Nutanix as well as Cisco’s requirements for UC virtualization. To quickly summarize… Nutanix is a virtualization platform that provides compute and storage in a way that is fault tolerant and scalable. Cisco UC provides a VMware centric virtualized VoIP collaboration suite that allows clients on many devices to communicate. Cisco has many requirements before their UC suite can be deployed in a virtual environment and the Nutanix platform is a great way to satisfy these requirements. In this post I’m going to cover the actual sizing and implementation details needed to design and deploy a real world Cisco UC system. This should help tie all the previous information together. Cisco UC VMs are deployed in a two part process. The first part is a downloaded OVA template and the second part is an installation ISO. The OVA determines the properties of the VM such as number of vCPUs, amount of RAM, and number and size of disks and creates an empty VM. The installation ISO then copies the relevant UC software into the newly created blank VM. I really like “Option 1 – Wing it from experience” since the sizing calculator is pretty complicated and typically provides output that I could have predicted based on experience. “Option 2 – Collaboration Sizing Tool” is a requirement whenever you’re worried about load and need to be sure a design can meet customer requirements. Unfortunately the Sizing Tool can only be used by registered Cisco partners so for this blog post we’re just going to treat it as a black box. Put this information into the Collaboration Sizing Tool and BEHOLD the magic. Let’s take an example where we have 1,000 users and we want 1:1 call processing redundancy. This means we need capacity for 1,000 phones on one CUCM call processor, and 1,000 phones on the failover system. We would also assume each user has 1 voicemail box, and one Jabber client. This increases our total to 2,000 devices (1 phone and 1 Jabber per user) and 1,000 voicemail boxes. Let’s assume that experience, the Cisco Sizing Tool, or our highly paid and trusted consultant tells us we need a certain number of VMs of a certain size to deploy this environment. The details are all Cisco UC specific and not really Nutanix specific so I’ll gloss over how we get to them. The first column tells us the Cisco UC application. The second column tells us how many VMs of that application are needed. The rest of the columns are the details for each individual instance of a VM. Visit the DocWiki link above for all stats on all products. This is a bit harder to quantify. The Nutanix Bible has a great writeup on how to determine how much disk space will be used by the CVM and NDFS clustering components. In a node where we have 16 cores available this means we’d have 12 cores (16 – reserved 4) for all guest VMs such as Cisco UC. A cautious reading of Cisco’s requirements though would instruct us to be more careful with the math. Even though it’s unlikely the CVM will ever use all 8 vCPUs. That’s a lot of text. Let’s look at a picture of how that placement works on a single node. I’ve taken a single Nutanix node and reserved vCPU slots (on paper) for the VMs I want to run. Repeat this process for additional Nutanix nodes until all of your UC VMs have a place to live. Depending on the Nutanix system used you may have a different number of cores available. Consult the Nutanix hardware page for details about all of the available platforms. As new processors are released this page is sure to be updated. 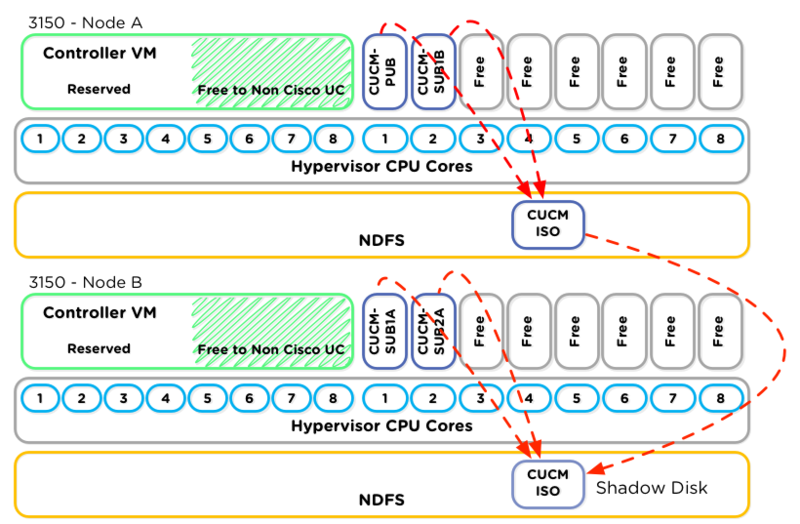 The shaded section of the provisioned, but not reserved, CVM vCPU allocation is critical to sizing and VM placement. 4 vCPUs that will go unused unless the system is running at peak load. UC VMs are typically not IOPS intensive, so I would recommend running some other Non-Cisco workload in this free space. This allows you to get full efficiency from the Nutanix node while also following Cisco guidance. Follow best practices on spreading important functions to multiple separate nodes in the cluster. This applies to ALL virtualization of UC. If we have one piece of hardware running our primary server for 1,000 users, it’s probably a good idea that the backup unit run on a DIFFERENT piece of hardware. In this case, another Nutanix node would be how we accomplished that. Remember that at least 3 Nutanix nodes must be used to form a cluster. In the diagram above I’ve shown just a single node, but we’ll have at least two more nodes to place any other VMs we like following all the same rules. In a large Nutanix environment a cluster could contain MANY more nodes. After the UC VM OVAs are deployed the next step is to actually perform the application installation. Without installation the VM is just an empty shell waiting for data to be written to the disk. I’ll use an example CUCM install because it’s a good proxy for other UC applications. The first Nutanix node has two CUCM servers and the second Nutanix node also has two CUCM servers. The installation ISO has to be read somehow by the virtual machine as it’s booted. In VMware we have a number of options available. When we select Datastore we can leverage a speedup feature of the Nutanix NDFS. If we put the CUCM ISO in the same NDFS container where the VM disk resides we can use Shadow Clones to make sure that the ISO is only ever read over the network once per Nutanix node. In our previous example with two CUCM servers, the first CUCM server on the second node would be installed from Datastore. When the second CUCM installation was started on that same second node, it would read the ISO file from the local NDFS shadow clone copy. Figure out how many and what size UC VMs are needed. Plan the placement of UC VMs on Nutanix nodes by counting cores and staggering important machines. Deploy the OVA templates according to your plan. Install the VMs from ISO making sure to use the Datastore option in vSphere. In our next blog post we’ll look at tools that can be used to make VM placement a bit easier and size Nutanix for different workloads. Thanks for following along! Your comments are always welcome. In the last post I covered an Introduction to Cisco UC and Nutanix. 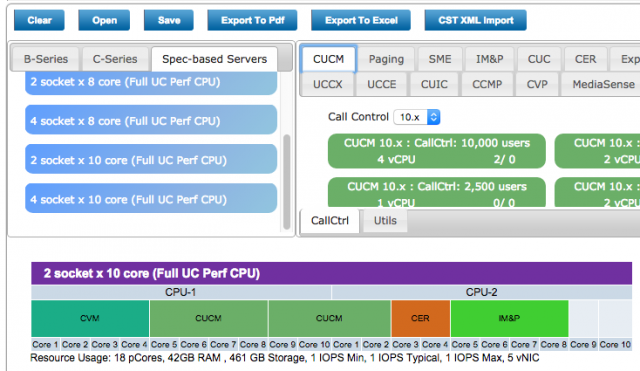 In this post I’ll cover UC performance and virtualization requirements. A scary part of virtualizing Cisco Unified Communications is worrying about being fully supported by Cisco TAC if a non-standard deployment path is chosen. This is due to a long history of strict hardware requirements around UC. When Cisco UC was first released in it’s current Linux based incarnation around 2006 as version 5.0 it could only be installed on certain HP and IBM hardware server models. Cisco was VERY strict about hardware revisions of these servers and a software to hardware matrix was made available. This lead to the creation of a “Specifications” table, listing exact processors, disks, and RAM for each supported server model. When you hear “Specifications Based” or “Spec Based” it all started here. 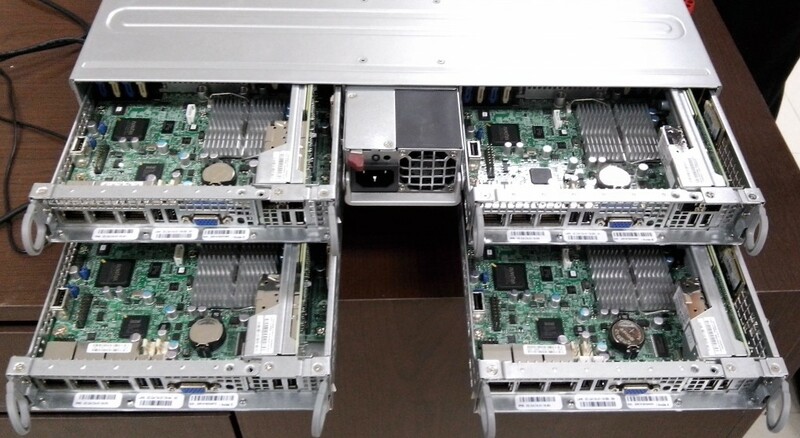 Customers were welcome to purchase a server directly from HP or IBM that used all of the same hardware components, but the Cisco MCS server (which was just a rebranded HP or IBM server) was recommended. If it was discovered a customer had deviated from the hardware specs listed in the matrix, they could be in an unsupported configuration. If this unsupported configuration was found to be causing a particular problem then a customer might have had to change out the server hardware before further support could be obtained. These calls to technical support were often very stressful and harrowing if it was discovered that the purchasing process for the hardware didn’t follow the Spec based matrix exactly. From a support perspective this makes sense. UC is a critical real-time application and non-standard hardware with less than excellent performance characteristics could cause all sorts of hard to diagnose and hard to troubleshoot problems. 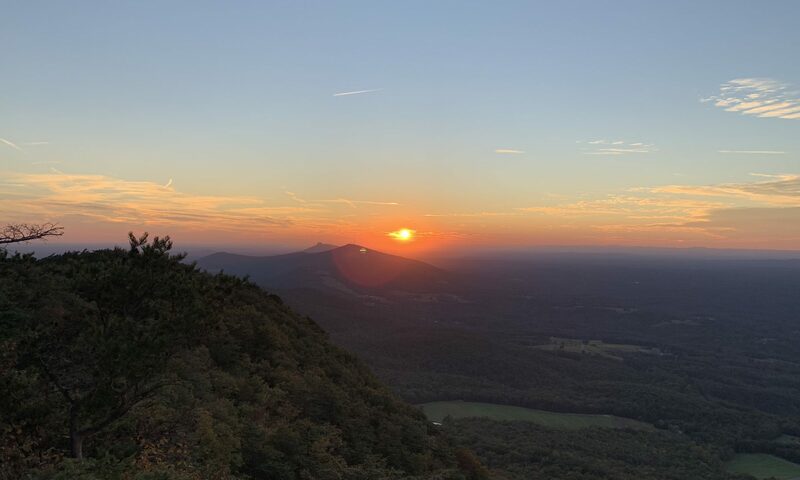 Working in support I saw my fair share of these cases where failing disks or problem hardware caused periodic interruptions that only revealed themselves through odd and intermittent symptoms. Let’s take a break from history to look at why performance is so critical to UC. Figure 1 shows where the CUCM Virtual Machine fits into the call path. Each IP Phone will have a TCP session open at all times for call control, sometimes called signaling. Typically in a Cisco environment this is the SCCP protocol, but things are moving to the SIP protocol as an open standard. All the examples below assume SCCP is in use. 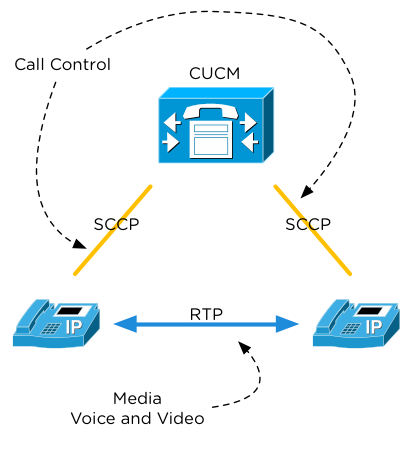 The SCCP call control link is used when one phone wants to initiate a call to another phone. Once a call is initiated a temporary media link with Real Time Protocol (RTP) audio/video traffic is established directly between phones. The following process is used to make a phone call. User dials all digits, but doesn’t receive lookup indication (ringback). This can cause users to hang up. This is EXTREMELY important to avoid because during a 911 call users will typically only wait a second or two to hear some indication that the call is in progress before hanging up. Consider the psychological impact and stress of even momentary dead air during an emergency situation. Destination phone answers, but audio setup is delayed at the CUCM server. This leads to a user picking up a phone saying “Hello, this is Jason”, and the calling user hearing “o, this is Jason”. Also consider that each of the above messages for a single phone call had to be logged to disk. Huge advances have been made in compression and RAM-disk usage, but log writing is still a critical component of a phone call. Call logs and call records are crucial to an enterprise phone system. Let’s look at this at scale. With a cluster of fully meshed call control servers and tens of thousands of IP phones, the situation is slightly more complex. Any single phone can still call any other phone, but now an extra lookup is needed. Where the destination phone registers for call control traffic is now important. Users in the Durham office may be located on a different Call Control server than users in the San Jose office. This means all of the above steps must now be negotiated between two different CUCM servers as well as the two phone endpoints. CUCM uses Inter Cluster Communication Signaling (ICCS) to do lookups and call control traffic between servers. A problem now on any one server could spell disaster for thousands of users who need to place calls and have immediate response. Any server response time latency will be noticed. Now that we have some background on why performance is so crucial to a real time communication system, let’s get back to the history. Cisco was slow to the virtualization game with Unified Communications. All the same fears about poor hardware performance were amplified with the hypervisor adding another possibly hard to troubleshoot abstraction layer. Virtualization support was first added only for certain hardware platforms (Cisco MCS) and only with certain Cisco UC versions. All the same specifications based rules applied to IBM servers (by this point HP was out of favor with Cisco). 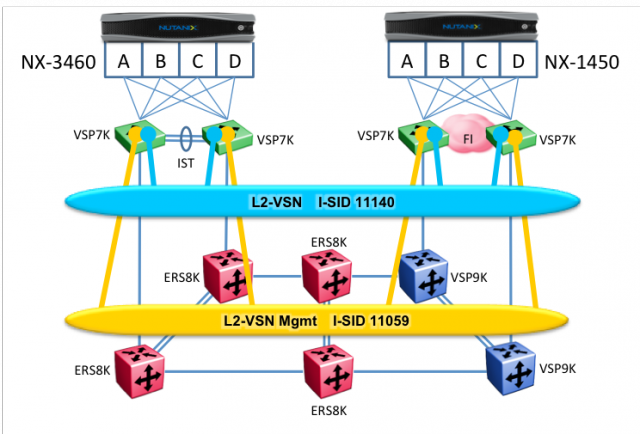 What everyone knew is that virtualization was actually amazing for Cisco UC – in the lab. Every aspiring CCIE Voice candidate had snapshots of Cisco UC servers for easy lab recreates. Customers had lab or demo as proof of concept or test. Cisco used virtualization extensively internally for testing and support. A Cisco UC customer wanting to virtualize had two options at this point for building a virtual Cisco UC cluster on VMware. The Cisco DocWiki page was created and listed the server requirements and IBM part numbers and a few notes about VMware configuration. Exceptions were made and the DocWiki was slowly updated with more specifications based hardware. Cisco Unified Computing System (UCS) is what really drove the development of the Cisco DocWiki site to include considerations for Network Attached Storage and Storage Area Networks. Now Cisco had hardware that could utilize these storage platforms and best practices needed to be documented for customer success. It also started the process of de-linking the tight coupling between UC and very specific server models for support. Now a whole class of servers based on specifications could be supported. This is largely the result of years of caution and strict requirements that allowed UC and virtualization to mature together. Customers had success with virtualization and demanded more. Today everything about Cisco UC Virtualization can be found on the Cisco DocWiki site. A good introductory page is the UC Virtualization Environment Overview, which serves to link to all of the other sub pages. In these pages you’ll find a number of requirements that cover CPU, RAM, Storage, and VMware. Let’s hit the highlights and show how Nutanix meets the relevant requirements. This isn’t anything Nutanix specific, but it’s important nonetheless. No oversubscription of ANY resource is allowed. CPUs must be mapped 1 vCPU to one physical core (ignore HT logical core count). RAM must be reserved for the VM. Storage is recommended to be done with Thick Provisioning, but Thin Provisioning is allowed. The big one here is 1:1 vCPU to core mapping. This will be a primary driver of sizing and is evidenced in all of the Cisco documentation. If you know how many physical cores are available, and you know how many vCPUs a VM takes, most of the sizing is done already! Specific CPU architectures and speeds are listed in order to be classified as a “Full Performance CPU”. The Nutanix home page provides a list of all processors used in all node types. All Nutanix nodes except the NX-1000 series are classified as Full Performance CPUs at the time of this writing. That means the NX-1000 is not a good choice for Cisco UC, but all other platforms such as the very popular NX-3000 are a great fit. Nutanix presents an NFS interface to the VMware Hypervisor. The Nutanix Distributed Filesystem backend is seen by VMware as a simple NFS datastore. The DocWiki page lists support for NFS under the Storage System Design Requirements section. There is also a listing under the storage hardware section. Most of the storage requirements listed apply to legacy SAN or NAS environments so aren’t directly applicable to Nutanix. The key requirements that must be met are latency and IOPS. This is another area where calculation from the traditional NAS differs. In the legacy NAS environment the storage system performance was divided by all hosts accessing the storage. In the Nutanix environment each host accesses local storage, so no additional calculations are required as the system scales! Each node has access to the full performance of the NDFS system. Each UC application has some rudimentary IOPS information that can be found here on the DocWiki storage site. These aren’t exact numbers and are missing some information about the type of testing that was performed to achieve these values, but they get you in the ballpark. None of the UC applications listed are disk intensive with average utilization less than 100 IOPS for most UC applications. This shows that again the CPU will be the primary driver of sizing. Cisco requires that any system for UC Virtualization must be on the VMware HCL and Storage HCL. Nutanix works very hard to ensure that this requirement is met, and has a dedicated page listing Nutanix on the VMware HCL. With the above requirements met we can now confidently select the Nutanix platform for UC virtualization and know it will be supported by Cisco TAC. The DocWiki is an incredibly useful tool to know that all requirements are met. Check the Cisco DocWiki frequently as it’s updated often! Before we conclude let’s take a look at one more unique feature of Cisco UC and the DocWiki page. Each Cisco UC application is installed using the combination of an OVA file and an install ISO. The OVA is required to ensure that exact CPU, RAM, and Disk sizes and reservations are followed. All Cisco OVA files can be found here on the DocWiki. Be sure to use these OVA files for each UC application and use the vCPU and RAM sizes from each OVA template to size appropriately on Nutanix. The ISO file for installation is a separate download or DVD delivery that happens on purchase. In the next post, we’ll cover the exact sizing of Cisco UC Virtual Machines and how to fit them onto an example Nutanix block. I’ll be publishing a series of blog posts outlining Cisco Unified Communications on Nutanix. At the end of this series I hope to have addressed any potential concerns running Cisco UC and Nutanix and provided all the tools for a successful deployment. Your comments are welcome and encouraged. Let’s start at the beginning, a very good place to start. Let’s start with an overview of Cisco Unified Communications just to make sure we’re all on the same page about the basics of the solution. UC is just a term used to describe all of the communications technologies that an enterprise might use to collaborate. This is really a series of different client and server technologies that might provide Voice, Video, Instant Messaging, and Presence. Clients use these server components to communicate with each other. They also use Gateway components to talk to the outside world. The gateway in the below image shows how we link into a phone service provider such as AT&T or Verizon to make calls to the rest of the world. Each of the above components in the Cisco UC Virtual Machines provides a critical function to the clients along the bottom. In the past there may have been racks full of physical servers to accomplish these functions, but now this can be virtualized. Redundancy is still one of our NUMBER 1 concerns in a UC deployment, but scale is also important. When the phone system goes down and the CEO or CIO can’t dial into the quarterly earnings call there is huge potential for IT staff changes. Even more importantly, everyone relies on this system for Emergency 911 calls. The phone system MUST be up 100% of the time (or close to it). Virtualization actually helps both in terms of scale AND redundancy on this front. Let’s look at each component of the UC system and see what it does for us as well as how it fits into a virtual environment. Cisco Unified Communications Manager (CUCM) is the core building block of all Cisco UC environments. CUCM provides call control. All phones will register to the CUCM and all phone calls will go through the CUCM for call routing. Because the CUCM call control is such a critical function it is almost always deployed in a redundant full-mesh cluster of servers. A single cluster can support up to 40,000 users with just 11 VMs. Additional clusters can be added to scale beyond 40,000 users. Once the size of the Cisco CUCM cluster is determined the next step is to deploy the VMs required. Each VM is deployed from an OVA which has a number of fixed values that cannot be changed. The number of vCPUs, the amount of RAM, and the size of the disks is completely determined by the Cisco OVA. The Cisco DocWiki site lists various OVAs available to deploy a CUCM server. The size of the CUCM server OVA used depends on the number of endpoints the cluster will support. 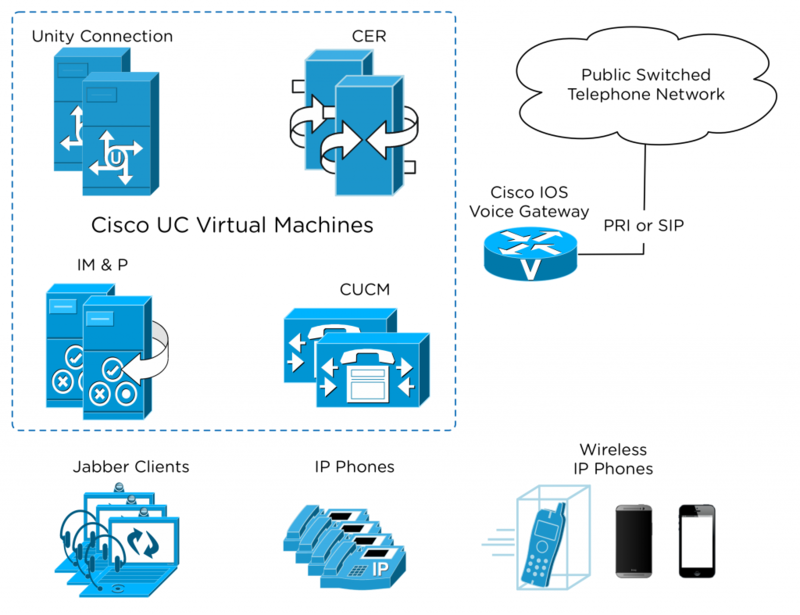 Cisco Unity Connection (CUC) provides Voice Message services, acting as the voice mailbox server for all incoming voice messages. CUC can also be used as an Interactive Voice Response server, playing a series of messages from a tree structure and branching based on user input. For redundancy each CUC cluster is deployed in and Active/Active pair that can support up to 20,000 voice mailboxes. Scaling beyond 20,000 users is just a matter of adding clusters. The OVA for CUC can be found on the Cisco DocWiki site. Notice that these OVAs for CUC have much larger disk sizes. Cisco IM&P is the primary UC component that provides service to Cisco Jabber endpoint Presence and Instant Messaging. Jabber clients will register to the IM&P server for all contact list functions and IM functions. The Jabber clients ALSO connect to the CUCM server for call control and CUC server for Voice Messaging. IM&P servers are deployed in pairs called subclusters. Up to 3 subclusters (6 IM&P servers total) can be paired with a single CUCM cluster supporting up to 45,000 Jabber clients. The OVA templates for IM&P can be found on the DocWiki site. 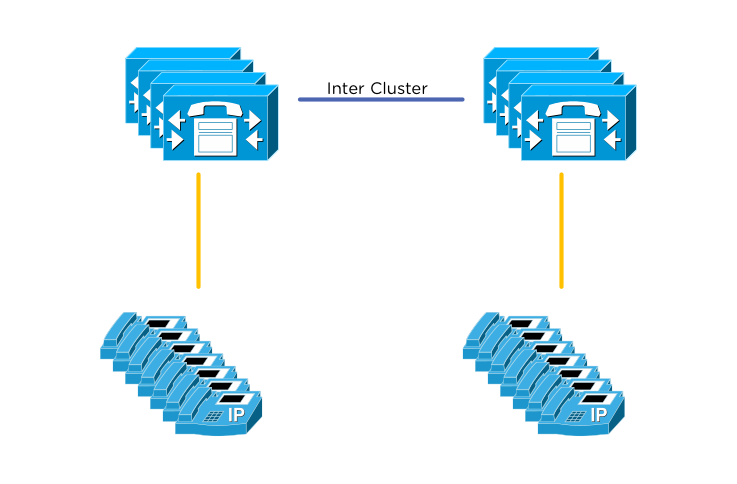 Each IM&P cluster is tied to a CUCM cluster. Adding more IM&P clusters will also mean adding more CUCM clusters. 911 emergency calls using a VoIP service often fall under special state laws requiring the exact location of the emergency call to be sent to the Emergency Public Service Answering Point (PSAP). The 911 operator needs this location to dispatch appropriate emergency services. VoIP makes this more complex because the concept of a phone now encompasses laptops and phones with wireless roaming capabilities which are often changing locations. Cisco Emergency Responder (CER) is deployed in pairs of VMs (primary and secondary) to provide Emergency Location to the PSAP when a 911 call is placed. CER will use either SNMP discovery of switch ports, IP subnet based discovery, or user provided location to provide a location to the PSAP. OVAs for CER can be found on the Cisco DocWiki. Additional voice server components can be found on the DocWiki page. They follow a similar convention of describing the number of vCPUs, RAM, and Disk requirements for a specific platform size. We’ll talk more about these individual components in the next part of this series, but for now it’s enough to just understand that each of these services will be provisioned from an OVA as a VM on top of VMware ESXi. Nutanix has been covered in great detail by Steven Poitras over at the Nutanix Bible. I won’t repeat all of the work Steve did because I’m sure I wouldn’t do it justice. I will however steal a few images and give a brief summary. For more info please head over to Steve’s page. The first image is the most important for understanding what makes Nutanix so powerful. Below we see that the Nutanix Controller Virtual Machine (CVM) has direct control of the attached disks (SSD and HDD). The Hypervisor talks directly to the Nutanix CVM processes for all disk IO using NFS in the case of VMware ESXi. This allows Nutanix to abstract the storage layer and do some pretty cool things with it. The Hypervisor could be VMware ESXi, Microsoft Hyper-V, or Linux kvm. We’ll focus on ESXi here because Cisco UC requires VMware ESXi for virtualization. The great thing is that to User Virtual Machines such as Cisco Unified Communications this looks exactly like ANY OTHER virtual environment with network storage. There is no special work required to get a VM running on Nutanix. The same familiar hypervisor you know and love presents storage to the VMs. Now we have the game changer up next. Because the CVM has control of the Direct Attached Storage, and because the CVM runs on every single ESXi host, we can easily scale out our storage layer by just adding nodes. Each Hypervisor knows NOTHING about the physical disks, and believes that the entire storage pool is available for use. The CVM optimizes all data access and stores data locally in flash and memory for fast access. Data that is less frequently accessed can be moved to cold tier storage on spinning disks. Once local disks are exhausted the CVM has the ability to write to any other node in the Nutanix cluster. All writes are written once locally, and once on a remote node for redundancy. Because all writes and reads will happen locally we can scale up while preserving performance. Nutanix Distributed Filesystem requires at least 3 nodes to form a cluster. Lucky for us the most common “block” comes with space for 4 “nodes”. Here’s an inside view of the 4 nodes that make up the most common Nutanix block. The only shared components between the 4 nodes are the redundant power supplies (2). Each node has access to its own disks and 10GbE network ports. Additional nodes can be easily added to the cluster 1 – 4 at a time using an auto discovery process. Now that I’ve been at Nutanix for a few months I’ve had a chance to really wrap my head around the technology. I’ve been working on lab testing, customer sizing exercises, and documentation of UC Best Practices on Nutanix. One of the most amazing things is how well UC runs on Nutanix and how frictionless the setup is. I had to do a lot of work to document all of the individual Cisco UC requirements for virtualization, but with that exercise completed the actual technology portion runs extremely well. In the next blog post I’ll cover all of the special requirements that Cisco enforces on a non-Cisco hardware platform such as Nutanix. I’ll cover exactly how Nutanix meets these requirements.